Gmail has always been the default e-mail service for countless people across the world. However, four years ago, Google decided to revolutionize the way we interacted with our e-mails and introduced Inbox, a new, better e-mail service alongside Gmail. Cut to April 2019, and today, Google decided the cut the cord of Inbox. What we’re left with is Gmail. Now, Inbox was not bad, it was awesome for some people, it just wasn’t a big step-up from Gmail, not being able to convince enough people to migrate. However, some people had grown to love Inbox, and throughout the years, the fan-base which Inbox created of people who migrated from Gmail and actually liked these new features, seems utterly sad about Inbox’s demise. But what was so cool about the Inbox? What were the features that aren’t on Gmail? 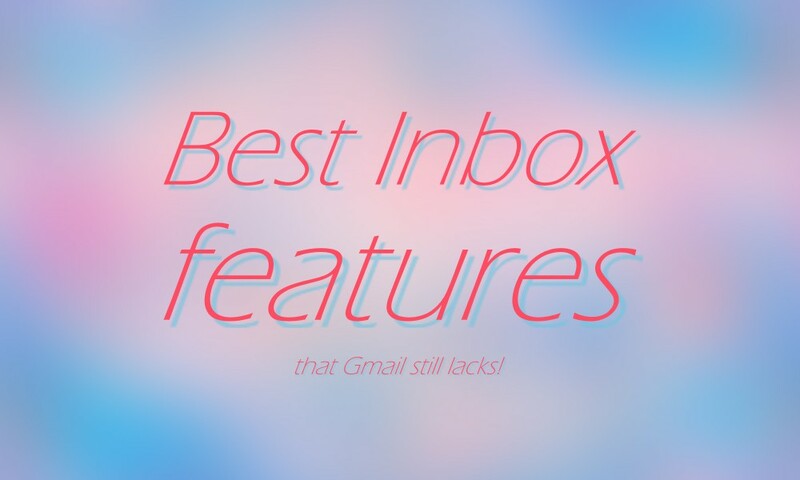 The best Inbox features Gmail lacks! Bundles was a signature feature of Inbox. It was what pulled people towards Inbox. The thing is Gmail’s interface always feels cluttered. It is disorganized. Everything takes a little more time. Bundles solved this problem. It was a new approach to organizing e-mails. Instead of organizing emails into labels or folders, Inbox automatically sorted out all the incoming emails into discrete bundles like social, finance, travel, promos and more. One can easily look inside a bundle and close it back up, even mark it as completed with a right swipe. This truly efficient way of sorting e-mails is not present in Gmail just yet. The functionality is likely being tested, however, Google points to an organization using ‘tabs’. We’re not entirely sure which would be a better option, but Bundles was very efficient and the signature feature of Inbox that we’re certainly going to miss. Another nifty feature of Inbox which is missing from Gmail is the ability to pin emails. When we pinned an email, it was easily accessible and discoverable. This improved chances of not deleting some important e-mails accidentally on our monthly trash clearing-out sessions. Gmail lacks this feature and there’s really no alternative to it as well. We can star or label a message, but that’s not even close to pinning e-mails. We will miss it. 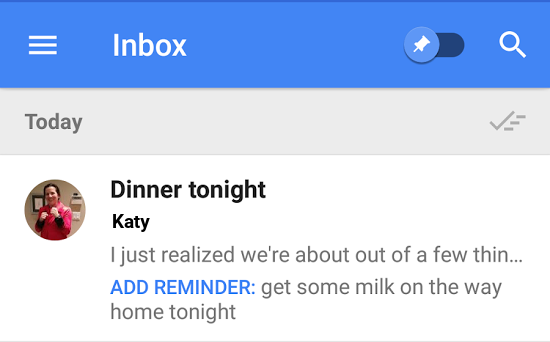 While Google will retain reminders as a stand-alone service, it is not implemented in Gmail. In Inbox, one could have easily assessed, managed and created reminders. These reminders could be attached to a specific email or a bundle. The Search algorithm of Inbox was awesome. It was very efficient. While Gmail was already a good way to search through e-mails, Inbox enhanced it to a better level by using bundles and quick cards. 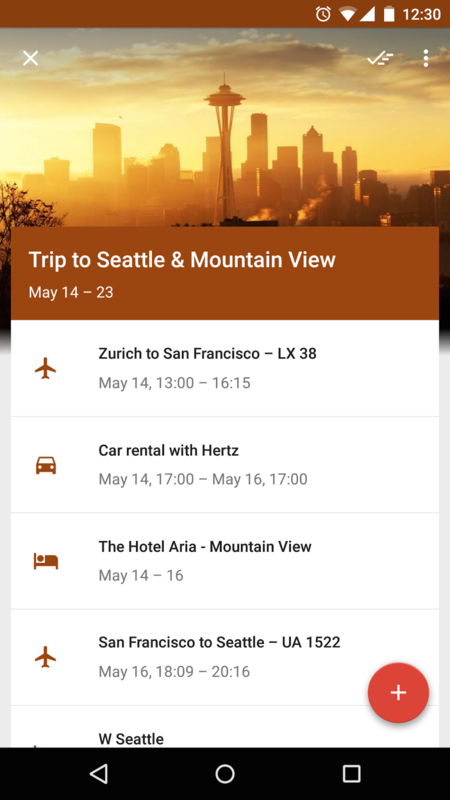 For example, if you want to search for the e-ticket of your next flight, you simply search for ‘ticket’, it will search through everything and find the most relevant result, your next flight ticket on a quick card. While this feature was discarded early on, it allowed users to save links and other content to their Inbox directly. It was supported on the web and on the Android. However, there’s a third-party app to bring back this feature if you’re interested, called ‘InboxIt’. The app basically emails you the content. So, there you go. These features, when clubbed together, offered really a very efficient way of interacting with e-mails. It’s a shame that Inbox has met its demise, but we’re hoping that Google will soon bring some of these features to Gmail. Looking forward to that!